Hey Mr Producer is a musical revue celebrating the shows of producer Cameron Mackintosh. Conceived and filmed as a Royal Gala for Her Majesty Queen Elizabeth II and Prince Philip, the show covers the long list of hit musicals and revivals produced by Mr Mackintosh. Among these are Cats, The Phantom of the Opera, Les Miserables, Miss Saigon and Oliver! Introduced by Julie Andrews and with a special appearance by Stephen Sondheim, the show featured both English and American theatre talent. 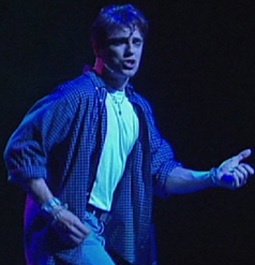 John, who originated the role of Cal Chandler in The Fix, performed One Two Three from that show as part of this revue.